Thanks to fellow children’s author, Joyce Ray (Feathers and Trumpets, A Story of Hildegard of Bingen, fall, 2013 Apprentice Shop Books) for inviting me to participate in the online literary blog called MY NEXT BIG THING. The blog is a series of questions about works-in-progress and not yet published titles. Many national and international writers have participated in this. It gives readers a glimpse into the working life of a writer. Part of the fun is tagging someone else. It is with great delight that I will be tagging two other writers at the end of this post. What is your next BIG THING? 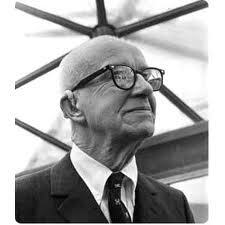 My NEXT BIG THING is a picture book about the early life of R. Buckminster Fuller. “Bucky” as his family and friends called him, was an American architect, inventor, systems theoriest, poet and teacher best known for his invention of the geodesic dome. Bucky was born “cross-eyed and near blind”, a condition that would shape the way he saw the world for the rest of his life. In his eyes, his steel tricycle, hard and cold to the touch, blended with house and the yard. Nothing was separate. Everything and everybody seemed to Bucky to blend into something else. As an adult, he would never lose that awareness that the earth was tightly connected into one complete whole. If he ever needed a reminder of that, he could simply take off his glasses “to see what I saw when I was four and a half years old.” Most of the book focuses on the summers he spent on Bear, a speck of an island 10 miles off the coast of Maine in Penobscot Bay. What is the working title of your new book? I’m working on that right now. He was perceived as quite the troublemaker as a kid, so I might work that into the title. Where did the idea come from for the book? I took an Outward Bound trip in my twenties, and after spending three nights, four days on solo, I became fascinated by living systems, how they work, their patterns, how I’m part of them. As I began to studying in the field of complex systems theory, I discovered Bucky alongside Ludwig von Bertalanffy, Joanna Macy, Donella Meadows, Elise Boulding, Russ Ackoff, Peter Senge and Fritjof Capra, and other systems thinkers. He has always fascinated me. Now that I have children, I want to share some of that fascination with them and other kids. What genre does your book fall under? A non-fiction picture book biography for ages 6 and up. Which actors would you choose to play your characters in a movie rendition? Oh, who would play the young Bucky? An undersized boy, with coke-bottle glasses, a larger than normal head and owl-like eyes? That’s a great question. 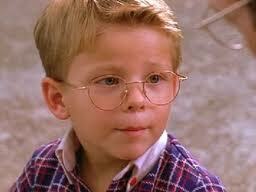 If Jonathan Lipnicki was still a young kid, he’d be perfect. I loved him as George in Stuart Little. What is a one-sentence synopsis of your book? On a small island off the coast of Maine, young Bucky Fuller discovers an infinite curiosity about the universe that changed the way many people think about this planet we call earth. How long did it take you to write the first draft of your manuscript? I am still writing it. I’m lucky to have met Gini Cunningham, an amazing storyteller and coach at a Jay O’Callahan workshop. Gini keeps me following the thread of what’s alive in the Bucky story. What other books would you compare this story to within your genre? I really admire Thomas Locker’s book about John Muir, John Muir: America’s Naturalist (Fulcrum Publishing, 2003). It’s beautifully written and illustrated and gives you a sense of how Muir’s young life helped to shape the adult he became. Similarly, Amy Ehrlich’s story about Rachel Carson, Rachel: The Story of Rachel Carson (Houghton Mifflin Harcourt; 2008), is another inspiring picture book biography. Who or what inspired you to write this book? As I said early, Bucky was a near-sighted, under-sized kid with bottle thick glasses. He got into trouble a lot, in part because he literally saw the world differently. His father died when he was 12; he was kicked out of Harvard, twice. Yet from a very early age, he was a keen observer of nature who dared to ask unpopular questions if what he was being told didn’t match his own experience. He would invent ideas, mostly inspired by his observations of nature, that have been used for decades. I admire how he picked himself up and found his way in the world. I want kids to have a champion. Just like Bucky, you have something special in you too! What else about your book might pique a reader’s interest? Back in the late 1960’s, Bucky helped spark the current environmental movement with his book, “Operating Manuel for Spaceship Earth.” He reminded us that we are all passengers on this spaceship we call “Earth”. How will we take care of it? He also coined the term “synergy”. What else are you working on? Well, I have another children’s book called When the Wind Blows. It is being illustrated by the amazing Jana Christy and will be published by Putnam in early 2014. It’s a very sweet, rhyming picture book that follows a brother and sister on a windy day. Now, it’s my honor to tag and introduce you to two other writers with BIG THINGS in the works  Jacqueline Davies and Corey Rosen Schwartz. Jacqueline Davies: I first met Jackie at her Rising River writing retreats and I was hooked. She is as good a writing coach as she is a writer. Jackie has been writing stories for children for over a decade. Her first book, Where the Ground Meets the Sky, was published in 2002. Four more books quickly followed: The Boy Who Drew Birds: A Story of John James Audubon (2004), The Night Is Singing (2006), The House Takes a Vacation (2007), and The Lemonade War (2007), which became available in paperback in 2009. Also in 2009, two more books were published: Tricking the Tallyman and Lost. Her newest book is the sequel to The Lemonade War. Check out her third book in the series The Lemonade Crime. My kids loved the whole series! Corey Rosen Schwartz: I met Corey through an on-line auction to raise funds for those impacted by Hurricane Sandy. Little ones who like a lot of action, will love her fractured fairy tale, Three Ninja Pigs. Corey just lets loose with her rhyme and you can tell she loves what she does! If you like to rhyme or want to learn, her blog The Meter Maids, with Tiffany Strelitz Haber, is wonderful.